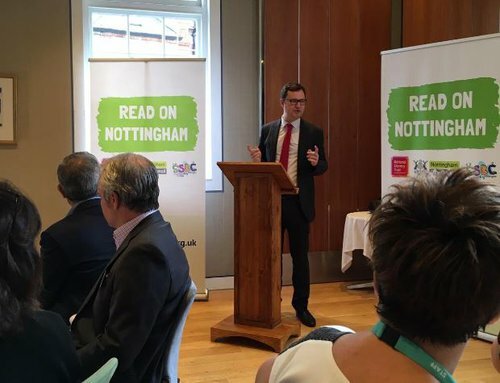 Last week Read On Nottingham hosted a breakfast for local businesses to encourage their support of the campaign and to discuss the importance of literacy in maintaining the future prosperity of the city. The event saw an impressive turnout of 48 delegates from businesses including Addo Food Group, Uber, Capital One, Browne Jacobson, and the two local football clubs, Nottingham Forest FC and Notts County FC, who learned about Nottingham's literacy challenges and how they can support local programmes and initiatives. Attendees heard firstly from MP for Nottingham North Alex Norris, who discussed literacy in the city of Nottingham, including its position as a UNESCO City of Literature. The National Literacy Trust's Chair of Trustees, Dame Julia Cleverdon DCVO CBE, then spoke about the important role that businesses can play in raising literacy levels. Representatives from law firm Browne Jacobson shared their experience of supporting our Words for Work programme, Addo provided insight on supporting the literacy skills of the workforce, and Councillor David Mellen spoke about engagement of employees and customers. Nottingham Hub Manager Emily Landsborough said: "We were thrilled to meet so many engaged businesses as part of our breakfast event. We're really looking forward to exploring ways to work in partnership on upcoming Read On Nottingham activity and inspiring a whole new generation of readers in Nottingham who have the literacy skills they need to succeed."